When blue sky turns to grey. at the ending of the day. When my head has does nought but frown. For me you'll act the clown. You're the one I love to hold. Whether deep in thought or talking sh*t.
You make no big deal of it. Thank you for how you make me feel. Please know how much I do love you! 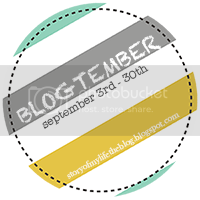 Blogtember 2013: No Turning Back! Blogtember 2013: "The Tale of the Fridge Spider"